In this riveting novel, Henrietta Lacks is an unknown hero that saved millions of lives throughout the decades after her death. In January, 1951 Henrietta Lacks walked into Johns Hopkins Hospital and said “ I got a knot in my womb. The doctor need to have a look.” And from there history changed like no one could imagine. Dr Howard Jones removed part of the tumor, biopsied it and cultured it without her permission. When the tumor grows voraciously, time and time again, it’s a windfall for the Medical world but far from it for Henrietta’s family. 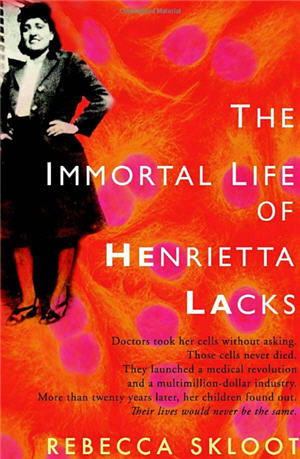 This book follows the cultured cells taken from Henrietta Lacks – called ‘HeLa’ from the first two letters of her first name and the first two letters of her last name. A doctor by the name of George Gey performed endless experiments that would have been impossible with living humans. Exposing them to radiation and infections, ultimately resulting in the polio vaccine and so many more. While the doctors were performing endless tests and making millions on selling the cells that she actually gave consent to do anything with her family was not forgotten, in fact they were never though of to begin with. The author Rebecca Skloot leads you through the fascinating story of the HeLa cells and how while the medical establishment was reaping the benefits of the cells, the family left behind lived in poverty and squalor. They couldn’t afford medical care and suffered greatly. The only thing that kept them going was their faith. It’s a raw, complicated and captivating story of how a small woman helped saved millions of lives, and how the family left behind struggled with her loss, not knowing her impact on the world. Thank you for doing this book review. I’ve never heard of it…but now I want to read it badly! Thanks! You won’t be disappointed! I was really unsure when I picked it up but then I couldn’t put it down. I will warn you – the scientific parts are a little tedious to get through. Enjoy!